I feel as though I missed something with The Great Gatsby. It was ok and listening to it was entertaining enough but a few months of reading War and Peace and a holiday later and I don’t really have much to say about it. So this is going to be a longer than necessary post where I try to pad out my limited views into something approaching a review. When I mentioned to someone at work what I was listening to, they sort of lit up and started talking about how great a book it was and telling me about their favourite part. I struggle to reconcile that kind of enthusiasm with the story that I read and that’s before we even get the countless boards and groups and organisations lauding it as the greatest American novel of the 20th century. 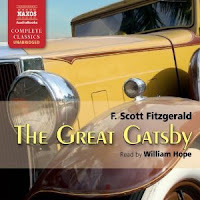 I can appreciate that the themes say a lot about the time Fitzgerald was writing in and that it has merit as a social commentary on the various indulgences of the 1920s but as a story? It’s decidedly…blah. I’ve never been one for themes and ideas over plot and characters. It is mercifully brief, however, so I never got to the point where I was completely sick of it before it had finished. I didn’t really like any of the characters but I didn’t hate them. I enjoyed the descriptions of the lavish parties and decadent nights but Nick Carraway’s general day-to-day musings were somewhat less than engaging. Daisy and Tom are on the face of it the embodiment of the American dream notwithstanding the fact that they’re completely dysfunctional as a couple. The fact that they’re completely uninspiring and actually faintly boring is actually quite an achievement, when you think about it. There’s one scene where Tom goes bananas and punches a woman in the face for being a bit annoying but other than that, they’re dull. Nick has a love interest, Jordan Baker, who was quite fun at first but seemed pretty brittle as a character and sort of wafted around on the sidelines without really being developed properly. The overall effect was pretty underwhelming. The only bit that I genuinely liked was the ending. And not in a sarcastic ‘I was only really pleased when it was over’ way. I just didn’t see it coming and yet when I’d listened to it, it seemed the only way that the story could have ended. It fit with the characters in a way that the rest of the story never seemed to and the final few scenes were actually quite moving, which was a pleasant surprise. While I might not have been the biggest fan of The Great Gatsby, I do think it’s sad that F. Scott Fitzgerald apparently died without knowing how much of a success the novel would eventually become. I may not understand how it quite managed to obtain its spot on so many American teenagers’ high school reading lists but I didn’t hate it so much that I wanted Fitzgerald to believe himself a failure over it. Overall: Ach – it was alright. I didn’t hate it but I didn’t love it. I’m curious about the film and can’t imagine anybody better than Leonardo di Caprio to play Jay Gatsby. I’m glad I’ve ‘read’ it but I won’t exactly be recommending it particularly widely. Midori Traveler's Notebook: It's HERE!